We encourage you to visit often and stay as long as your schedule allows. Visitors needing of wheel chair assistance are encouraged to check in with our receptionist in the main lobby. For a small fee, you may order a guest meal from our receptionist and dine with your loved one anytime. Notary Service is available at no charge during normal business hours. Take advantage of our free Wi-Fi access and stay connected with the outside world. Our patients and residents always enjoy the opportunity to connect with family and friends through email and social media outlets. 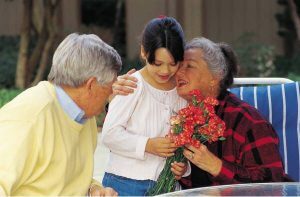 Connect with your loved one by joining in one of the many structured activities happening throughout our facility. Music programs, arts & crafts, spiritual services, birthday celebrations, and holiday / special events are offered every month. Your participation is always welcome.